Liquid Zoo - "The Return Of The Fevertree"
From Germany, Liquid Zoo play heavy psychedelia with a stoner rock edge. When the band blasts off into jams I'm often reminded of a stoner version of Bevis Frond, and, like the Frond, Liquid Zoo have a knack for writing catchy songs, though they typically (thankfully) insist on keeping the pop element in the acidic mindfuck realm. The band consists of Peter on drums, Elke on bass, Jörg on guitar and vocals, and Tom on vocals and guitar. Songs like "Tonight", "Statue", and "Cedar & Pine" illustrate Liquid Zoo's talent for catchy tunes that straddle the pop realm while simultaneously pounding the acid rock pavement. "Tonight", in particular, is a good example of the band's brand of heavy psychedelia with a stoner edge. Simple melting acid guitar licks and a thudding bass line. "Breakwater" is another track I enjoyed with solid jam portions like "Tonight". "Not Waving But Drowning" is my runaway favorite track on the album. It starts off slowly, creating an eerie atmosphere with metallic psych guitars. The chorus is an intense killer blast of riffs and a simple, but again, catchy melody. This song reminds me quite a bit of Porcupine Tree though Liquid Zoo is much more acidic than Porcupine Tree. Still, I'd say the analogy gives a good reference point. The other standout track is "Galaxy Voice", an 11-minute jam tune that isn't one of the stronger tracks on the album, but does get quite intense and gets high marks for being a solid trip tune. 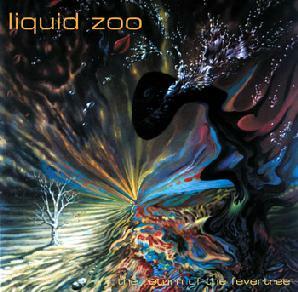 In summary, Liquid Zoo play pretty decent stoner psychedelia, but stand out for their ability to incorporate actual songs, and catchy ones at that, within their trippy jamming framework. I hope to hear more from them. You can visit Liquid Zoo at their web site. Listen to sound files at the band's Mp3.com web site. The Return Of The Fevertree is distributed by Swamp Room Records. You can visit their web site.